Optimizing your page to attract followers will require you to spend time figuring out how best to use Facebook marketing for your business. There are a few variables to consider, like choosing the best industry-specific content to appeal to your audience, choosing the most effective keywords for search engine optimization, and monitoring the analytics to make the necessary adjustments to optimize for success. 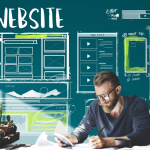 Note: You could learn through trial-and-error without spending money, or you could save your time and make your marketing dollars count by hiring digital marketing professionals like Hibu. Hibu is one of a select few official Facebook Marketing Partners, and they can create custom campaigns quickly, while also enhancing your online presence as a whole. Click here to reach a representative. Make your Facebook business page is visually stunning and content-rich. If done correctly, your Facebook page will act as a landing page for interested Facebook users and also help you rank higher in Google’s local search results. Create a robust Facebook profile by choosing accurate keywords, claiming a vanity URL and incorporating appealing photos. To start attracting customers through marketing on Facebook, sign up for a Facebook business page. First, log in to your personal account and choose “Create Page” from the drop-down menu in the upper right corner of the page. The platform will then guide you through the process of creating a Facebook page, including choosing a business category, sharing details about your business, and posting appealing and informative photos. Provide basic information about your business like your business name and contact information to complete setting up your Facebook business page. Facebook requires local businesses to complete this section before allowing you to create a page. You won’t be able to move on to the next step without the information above, so have it handy when creating your Facebook business page. When creating your page, choose a web address that describes your business like www.facebook.com/yourbusiness. This will give your page a professional and branded feel, and the URL will be easy to share with customers. If you don’t change your URL, the default will include random numbers that make it difficult for customers to find and remember. Just remember you can only change your URL once, so make it a good one. Your cover photo and profile picture are the first things people notice when they visit your page. Make sure the images are captivating and applicable to your business. Maximize the marketing potential of your Facebook photos by changing your cover and profile pictures seasonally or if you want to promote an event or company milestone. Check out these do’s and don’ts when it comes to creating your cover image, and use Canva to create a great-looking cover photo for free easily. Screenshot of Fuzzy & Birch Facebook cover photo. Your About Us or About Me section should be under 250 words and provide helpful information like contact information and include keywords that let people know what your business is about. For example, keywords for a pizza restaurant would be “pizza” and “Italian food.” Be descriptive in this section and use as many characters as Facebook allows. Fill out this section clearly to let visitors learn about your business and inform search engines like Google. 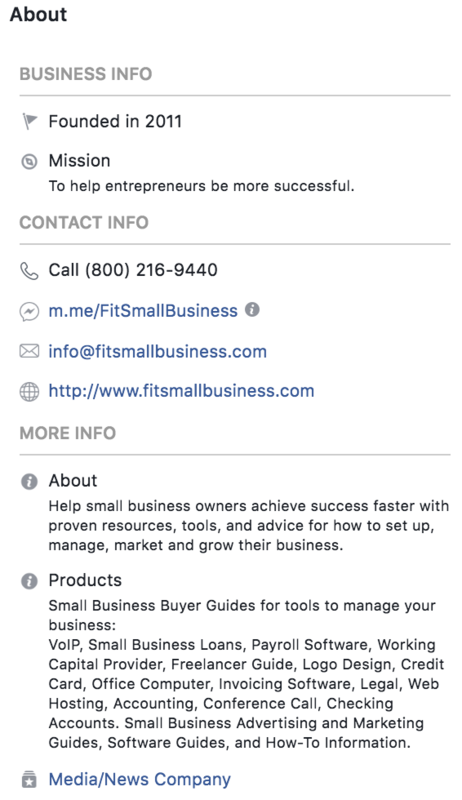 Screenshot of FitSmallBusiness Facebook About page. Check out our guide to search engine optimization (SEO) to learn more about choosing effective keywords for your business’s Facebook profile. Facebook’s business story feature allows users to share more details about their business. Optimize this section of your Facebook business page by using a marketing-oriented title and using keywords for added SEO value. Use your story to describe how your business started, promote popular products or highlight valuable members of your team. Remember that only the first 100 words will show up in your About section. Positive reviews are a great way to attract potential customers to your business for free. Ask loyal customers to leave a review or offer a discount to people who write a review on your Facebook page. Facebook reviews serve as a particularly valuable free marketing tool because they can show up in search engine results. It can be tedious to set up a Facebook business page that represents your brand well and markets to your audience, but it’s well worth when done properly. Try enlisting the help of a freelancer from Fiverr to make sure your Facebook page includes all the pertinent information about your business and attracts potential customers. Freelancers are available to optimize your current page or maintain it on a regular basis, so you can focus on running your business. Click here to start browsing. The best way to attract fans to your Facebook page is to identify your company’s ideal clientele with a customer profile based on demographics and psychographics. Then, create content that directly appeals to your ideal customer. Content that’s tailored around your target audience will perform better under Facebook’s algorithm and get more likes, comments and shares than generic content. Promote your Facebook page on all of your marketing materials, including business cards, signs, email signatures and website. Make sure you set up a vanity URL for your Facebook page like www.facebook.com/yourbusiness so that it’s easy for people to find your page. By sharing your Facebook page with your current customers, you’ll increase likes and build your following through their network of friends. Valuable Facebook content is informative, entertaining and engaging. Post interesting articles, help customers relate to your brand on a personal level and post videos, quotes and customer photos to draw your audience in and keep them engaged. Use your Facebook business page to share content that’s relevant to your brand and entertaining for potential customers. The goal of marketing on Facebook is not only to get people to read your article but also for them to like, comment, and share. Articles don’t have to be from your personal blog or website but should be related to your small business’s products, services or industry. Capture and keep the attention of your followers by regularly posting interesting content that will keep potential customers thinking about your business. Screenshot of Yogaja Yoga blog sharing post. Quotes get a lot of shares because people who feel entertained or inspired by a post want to share the feeling with others. Use a platform like Canva to create a quote image for free or search the internet for existing images that are relevant to your products and consistent with your brand message. Always include your logo so if your quote is shared by a third party, you’re still advertising your business. 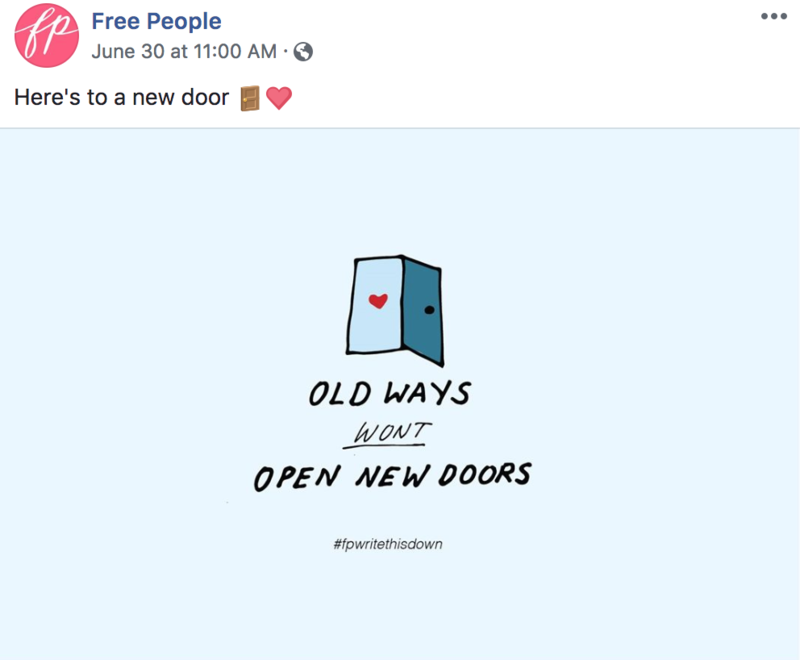 For example, the clothing brand Free People uses the hashtag #fpwritethisdown to highlight inspirational content on its Facebook page. Share quotes or images that are consistent with your branding to attract potential customers to your content and create an emotional connection with your followers. Screenshot of Free People inspirational quote post. Posting pictures of your customers enjoying your products or services is a great way to show up in news feeds organically. With permission, tag your fans in pictures — not only will this alert them to the post, but your post will also likely appear in the news feeds of the fan’s friends. Encourage people are also more likely to like and comment on your posts by including photos of friendly faces your customers may already know. For example, if you own a restaurant, take pictures of your customers eating your signature dish. If you’re a real estate agent, take a picture of your client in front of their new home. Screenshot of The Kitchen Bistro Facebook post. 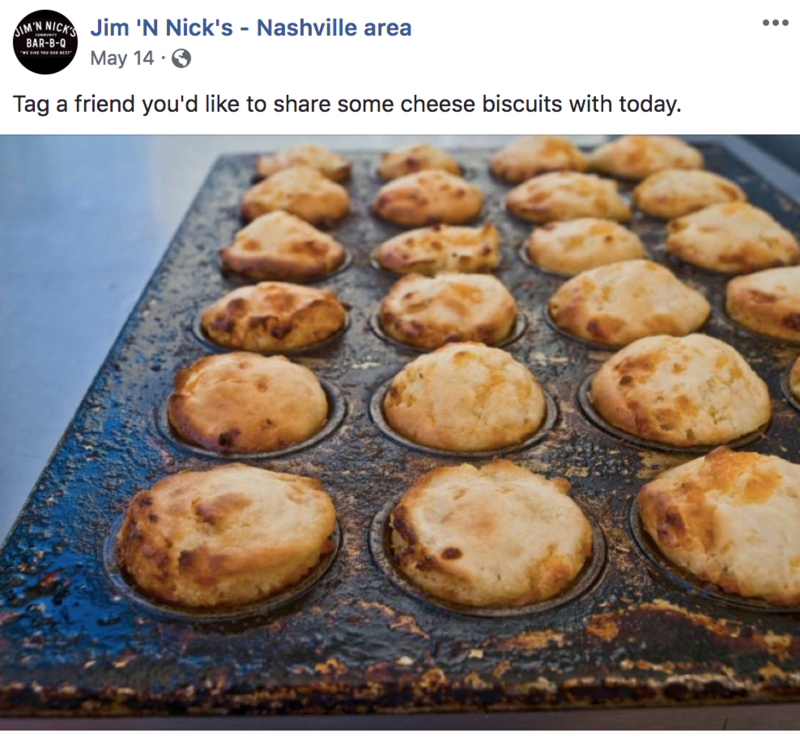 For example, Jim ‘N Nick’s Bar-B-Q is a barbecue restaurant that is famous for its cheese biscuits. The company created the post below and asked their existing clientele to tag a friend who would enjoy the product. Posts like this keep your customers engaged and have the potential to increase your followers. Screenshot of Jim ‘N Nick’s Facebook post. Asking a question in a Facebook post is a great way to focus user comments on a specific product you offer or another topic that’s advantageous to your marketing scheme. Followers who take time to leave a response are more likely to stay engaged with your brand and buy into your products or services. Keep followers engaged by asking a question that is seasonally relevant or about a particular event, holiday or product. Screenshot of Valerie Parr Hill Facebook post. Videos auto-play as a Facebook user scrolls down his or her newsfeed. This feature makes video posts extremely eye-catching. Post a featured video to your page that highlights one of your products, services or a key member of your team. People will be more engaged with your marketing on Facebook if you give them a behind-the-scenes look at your business. 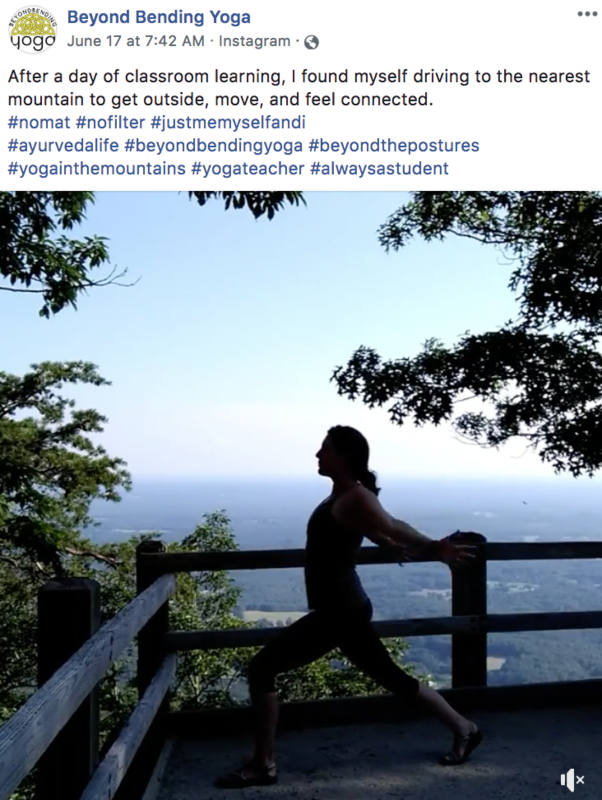 Screenshot of Beyond Bending Yoga Facebook video post. When you record the video, make sure you use video marketing software like Hippo Video. It allows you to easily record custom videos and easily embed them into email and social media. Hippo Video also provides analytics to let you know which videos get the most interaction with your audience, so that you can modify underperforming posts to better convert traffic. Click here to try it free. Once you know how to market on Facebook for free, evaluate how well your customers are engaging with your content. Facebook posts are a great way to attract customers to your business but should be optimized to reach your entire target audience. 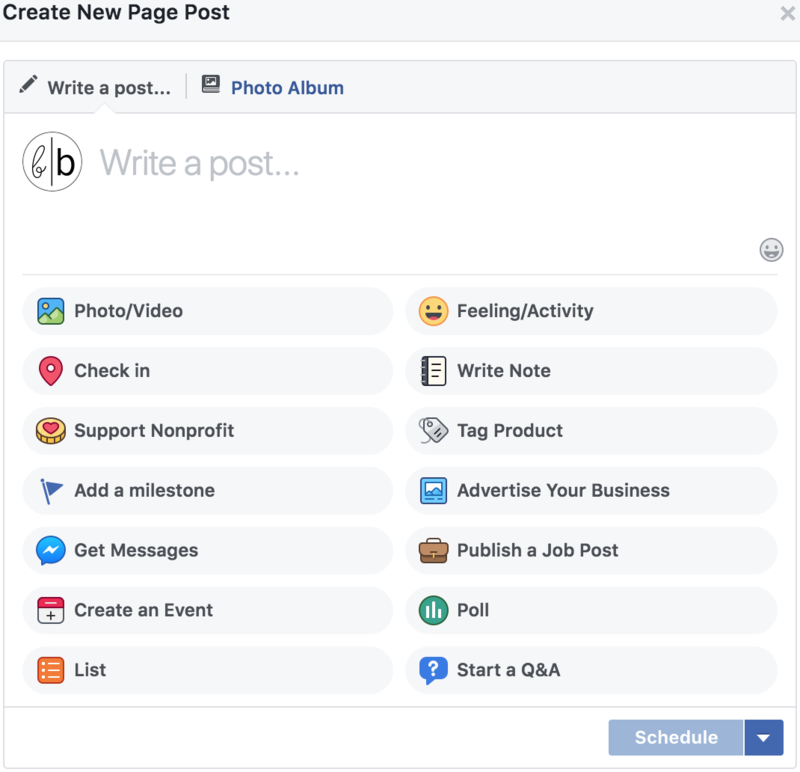 Use Facebook’s Page Insights scheduling and post-boosting features to expand your Facebook page’s reach. To track how well your posts are doing, go to the Insights tab at the top of your Facebook page. Once there, you’ll be able to see all of your activity, including the reach and engagement of your posts. Screenshot of Facebook Insights tab. We suggest creating a schedule for your posts to help you stay on track with your posts and ensure you’re sharing the right posts at the right time. Prioritize your Facebook page and maintain your marketing on Facebook by scheduling posts for at least three times per week. The good news is that Facebook lets you schedule posts, so by sitting down for an hour or two once a week, you should be able to get all of your Facebook posts done for that week. If you don’t have the time or expertise to sit and schedule your Facebook posts every week, use Hibu to handle it for you. Hibu is a digital marketing agency that will manage your Facebook page by consistently posting industry-specific content on your behalf, monitoring the engagement from your audience, and retargeting the highest performing posts to drive more leads for your business. Click here to reach a representative. It’s important to understand how to market on Facebook for free, but you can also pay to boost your posts for a relatively low cost. If you notice that one of your posts is doing well and is engaging a lot of followers, boost the post so people outside of your network can see it. To maximize the impact of a boosted post, choose a targeted audience you think will be interested in your business. For example, if your business is hosting a sale or event, sponsor a Facebook post to share details. This kind of promotion will attract people outside your followers and help you increase page views and, ultimately, sales. Screenshot of Rejuvenation Facebook post. For more information on paid advertising on Facebook, check out our in-depth guide. Once you build a following and gain customer loyalty through optimized Facebook posts, promote a deal or event. Maintain followers and attract your target audience by focusing on customer benefits and pinning valuable offers to the top of your page. Share promotions with your followers to strengthen brand loyalty and encourage fans to buy your products. A great promotional post combines a call to action with good news for the Facebook user. 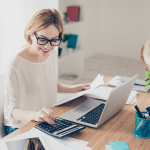 For example, if you’re trying to get people to contact your office for an appointment, combine information about your flexible business hours with a money-saving offer. Focus on the needs of your preferred clientele, tailor your Facebook promotions around them and then pin the promotion to the top of your Facebook page so your followers will see it first. 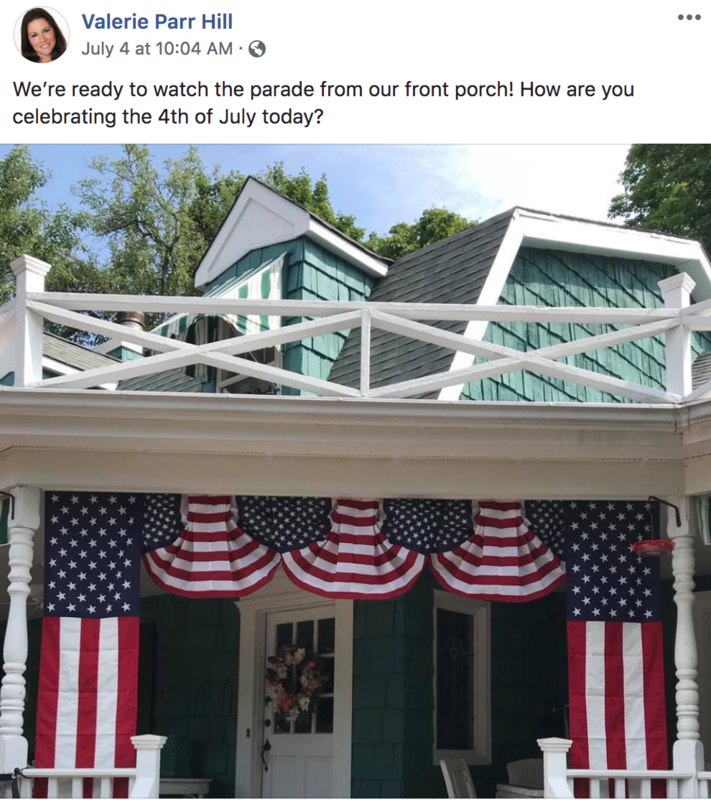 Screenshot of Independence Dental Facebook post. Facebook allows you to pin one post to the top of your page’s feed, so your followers are guaranteed to see it first. If you’re offering an exciting promotion, pin the post for the period that you’re running the special, so new page visitors to will see it. Typically, people don’t scroll very far down a page’s feed, so pinning an important post at the top of your Facebook business page makes it easy for them to see your high priority content. 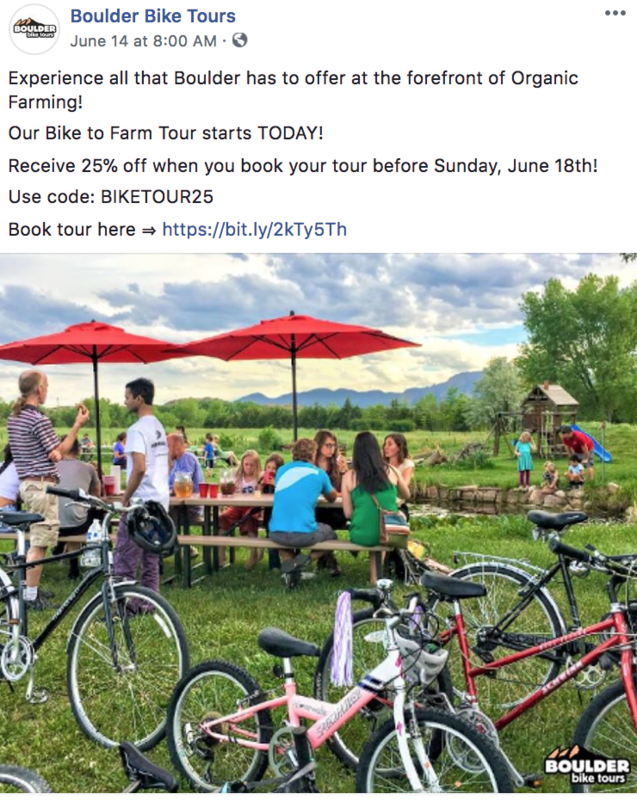 Screenshot of Boulder Bike Tours Promotional post. Our ultimate guide to Facebook advertising can help you create promotional posts that optimize free marketing on Facebook. 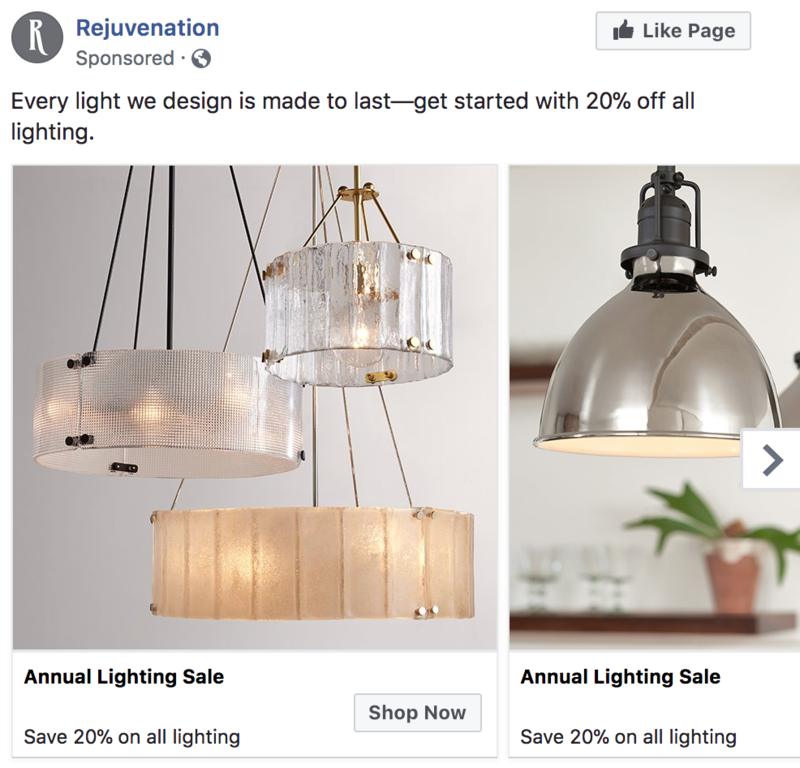 If you need some more inspiration, check out 25 Facebook ad examples with tips on why they work from the pros. 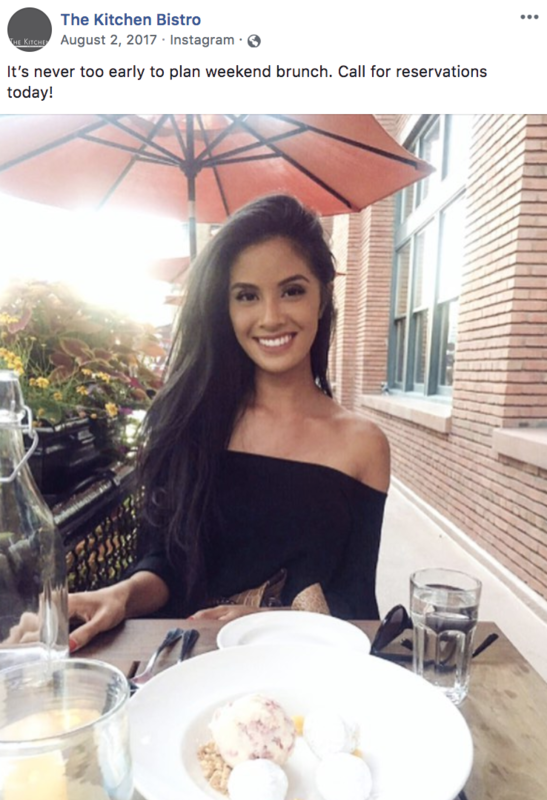 People come to Facebook to see pictures and status updates from their friends and family, news and entertaining memes, articles, videos and more. To maximize Facebook’s algorithm, post interesting content on your business’s Facebook page two to three times a day. Remember the general rule of thumb is to post 80 percent entertaining/interesting and 20 percent promotional posts. Facebook’s algorithm controls which posts users see and typically changes several times per year. On average, 10 percent or fewer of your followers will see your Facebook posts. However, when people engage with your posts by liking, commenting or sharing it sends a signal to Facebook that people are interested in your posts. This, in turn, increases the chance that your future posts will appear on user’s news feeds. 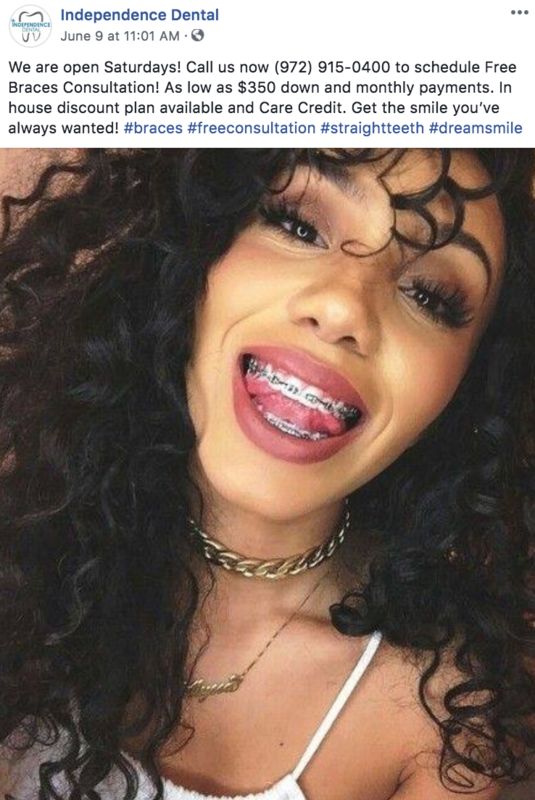 People come to Facebook to see pictures and news from their friends and family, interesting articles, entertaining videos and more. With this in mind, post interesting content on your page, so people engage with your posts by liking, commenting and sharing. In doing so, your followers send signals to Facebook that they’re interested in your posts and increase the chance your future posts will appear on their news feeds. The best promotional posts are informative, entertaining and offer your followers a great deal. A simple status update that reads “All winter coats on sale!” will probably not end up on many news feeds, but a status posted with an enticing image and an attractive offer has a much better chance of being noticed. Draw in your ideal clientele with promotions that provide both value and entertainment. It only takes about 15 minutes to set up a Facebook business page, but you should spend at least 1 to 2 hours per week on the site if you want to market your business successfully on Facebook. Creating engaging posts and respond to people who interact with your posts to optimize your page and get the most out of free Facebook marketing. How Do I Promote My Business on Facebook? To promote your business on Facebook, create an attractive, informative page and ask people to “like” it. Share interesting content and optimize posts for maximum engagement to keep and grow a loyal following. After earning the attention and trust of your audience, pin special offers to the top of your page to convert followers into clients. How Do I Build My Business with Facebook? Build your business with Facebook by setting up a Facebook business page that shares helpful information and provides interesting content like entertaining videos and inspiring quotes. Increase followers by asking customers to “like” your page, leave reviews and share posts. Then, turn followers into paying customers by offering deals that keep them interested in your brand. Promote your Facebook page without paying by tailoring posts to your target audience and engaging followers. Share photos and videos of your products and employees to build trust and interest in your brand. Once you have loyal followers, pin a valuable promotion to the top of your page, so it’s the first thing your fans see. Marketing on Facebook doesn’t have to be expensive but does require you to create and share entertaining and informative content with your audience. Use your Facebook business page to post inspirational quotes, interesting articles and customer reviews. A well-curated and optimized Facebook page keeps the attention of existing followers and attracts new ones to your brand. If you’d rather have a professional digital marketing agency take care of your Facebook marketing instead, use Hibu. It takes the task off your hands and frees up time you could be spending running your business. Click here to reach a representative. Thank you for this great article. 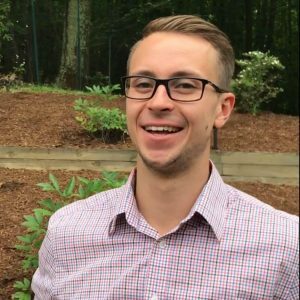 I like the interesting ideas about running a contest and the 3rd party resources you have listed. Reading your article I actually feel that I can do it with my somewhat limited skills. My question is how to reach people outside of my current FB fans who have seen my posts too many times already even though I think that they will respond to the contest with a price. We also would like to expend the list of our new business fans. You can read our guide to How to Advertise on Facebook for more info on this. Hi…I just wanted to say what a fb read i found this. I have predominantly been in publishing and media throughout my career however now branching into the fitness industry with my partner and opening a gym… this has given me great grounding just to run over the checks i need to ensure the efficiency of what we are doing. If you do decide to advertise on Facebook, you can check out our guide to Facebook advertising here. Thanks a lot for your instructions. I’m new to FB biz page, I just started it today for my Hvar Day Sailing Trips business in Croatian most fashionable Island of Hvar. And i want to conserve it in order to study it and put it in practise, but I did not find any “download” button ! We don’t have a way to download, but you can hit the “print” button on the left side of the screen.